Luckily, Dr. Jart + has a new Prescriptment Mask Collection designed to treat skincare concerns—and the Water Replenishment Mask lives up to its name, yielding soft and replenished skin after just one use. The Water Replenishment Mask is made from environmentally friendly Tencel cotton and delivers a concentrated, hydrating serum containing camomile flower water, hyalronic acid, witch hazel extract, olive extract, and more. It’s soothing and smoothing, and your skin will look noticeably better after the 15-20 minute session. Just wash you face, apply the mask, and relax—after the suggested time has elapsed, rub the remainder of the serum into your skin. We recommend doing this right before bed so your skin has plenty of time to reap the rewards of this single-use sensation. Other masks in the collection include the Blackhead Master Patch, All that Lift & Firm, Pore Minimalist, and Brightening Infusion. 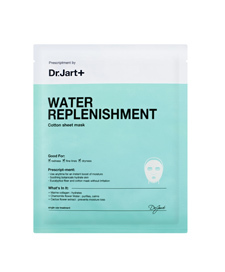 The Dr. Jart + Prescriptment Mask Collection retails for $7.50 per mask and is available at sephora.com.